The ‘Red Bag’ Hospital Transfer Pathway, which was highlighted in the recent NHS Long Term Plan, is now running across south London. But how effective is it? The HIN has produced this evaluation report which explores the impact and stakeholder experiences of implementing the pathway within three south London boroughs. A new evaluation report has found that vital communication between paramedic crews, care home staff and hospital clinicians has been improved by the Red Bag Pathway when all measures were adhered to, but there are still a series of barriers to best practice to overcome. The study, which included survey responses, interviews with hospital clinicians and paramedics, and a focus group with care home managers, found that the majority of care homes are using the Red Bag as intended. Conducted by the Health Innovation Network, the report said that improvements need to be made at both ends of the pathway to ensure it is adhered to and the benefits are fully realised. Pioneered by Sutton Homes of Care Vanguard, the pathway ensures vital medical information, such as current medical condition and medicines regime, travels with the care home resident in a specially-designed red bag when they make emergency hospital visits. Over two-thirds of the 90 survey responses from care homes, ambulance crews and hospital clinicians in Kingston, Richmond and Lambeth, stated that the Red Bag had improved communication between care homes and hospitals and made the handover to ambulance crews smoother. Over half of care home managers believed the pathway had improved the transfer process for residents and both ambulance and hospital staff stated that the two forms most helpful in the Red Bag documentation were the ‘Do Not Attempt Resuscitation’ form, for older people making decisions about what happens towards the end of their life and the Alzheimer’s Society’s ‘This Is Me’ form to help healthcare professionals know more about people living with dementia. As well as highlighting some of the positive effects the pathway has had on emergency hospitals for care home residents, the study also flags some of the challenges faced in implementing the transfer pathway. These included finding that, on some occasions, standardised patient information was either missing or incomplete when residents were transferred to hospital, that medical discharge information was not always sent with the patient and that locating and retrieving bags that had become lost in hospital transfers was particularly difficult. 5. When receiving the resident back in the home, update the care plan records. Effective implementation of the Red Bag Pathway will contribute toward the Enhanced Health in Care Homes (EHCH) model as set out in the recent NHS Long Term Plan. The report launched at a HIN sharing event, attended by staff from all parts of the Pathway, designed to ensure the complexities of implementing the pathway and opportunities for improvement are discussed more widely so all parties can work together to keep improving the use of the Red Bag. “Our work is all about promoting innovation in the NHS and across the whole care system. 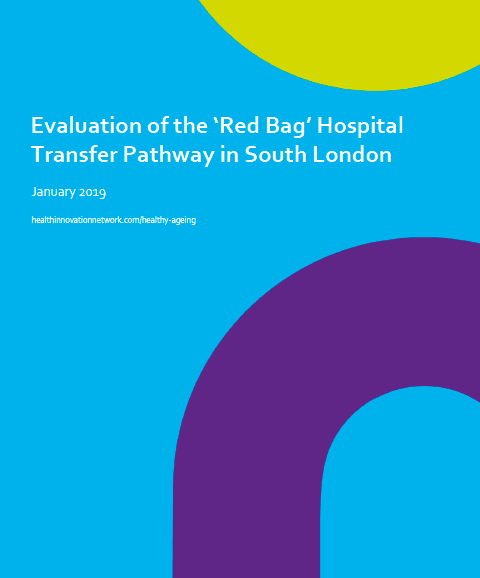 The Red Bag is a successful innovation born in Sutton and recently extended across the whole of south London, but this study shows that there are still challenges and a focus on careful implementation is needed to maximise the benefits. “Frail care home residents are at their most vulnerable when transferred in an emergency to hospital. It’s vital that the latest state of their health is communicated to all clinicians from ambulance crews to hospital staff so quicker decisions can be made over their care.